When venturing into a given career, the ultimate goal is to become a professional. Across different professions, there are certifying bodies that issue certificates to credible and deserving candidates who have matched the require training requirements. Plumbers also go through a similar process and get to learn about all the plumbing codes. Here are the details regarding plumbers and the codes they have to follow to do their job. Just as trained professionals in other fields, it is absolutely necessary for plumbers to deliver their services based on particular guidelines. In so doing, clients will enjoy consistency in service delivery even with a change in the plumbing service provider. At the same time, the new provider will have it easy carrying on with an existing project. Regardless of the situation, change has proved to be inevitable. In the process of incorporating new ideas, technology has clearly played a major role. A good number of tools and parts that were common a few years ago in plumbing are no longer recommended for current projects. Professionals have also had to revamp their skills by going for further training. Although small in a considerable number of areas, plumbing codes have changed for the better. The new codes tend to give much weight to the welfare of the future occupants of the structures, be they commercial or residential. Further, plumbers need to observe new standards to ensure the structural stability of buildings. For less experienced plumbers, implementing all the new codes may prove challenging. However, given the fact that the codes mainly emphasize what plumbers learn during the training period, applying them will prove beneficial. In one way or another the new plumbing codes do influence service delivery in a positive way. Most noteworthy is the fee schedule that is part of the updated list of codes. Based on that guideline, it becomes less challenging to determine the amount of fees a plumber should charge his clients. Otherwise, quoting the most appropriate amount for a new project is always a problem with chances of over or under estimation. Thanks to the new codes, plumbers only need to use the appropriate parts on their respective systems. In so doing, the chances of compromising the quality and stability of the system become minimal. Such an approach benefits both the plumber and future users of the system in the sense accidents will less likely take place. The fast-paced manufacturing sector is usually quick to adapt to new measurements and standards. Given that trend, the earlier you implement the new codes, the easier it becomes to achieve consistency in all areas plumbing from the tools to parts used. At the same time, the approach will effectively lead to well-installed and properly working systems. 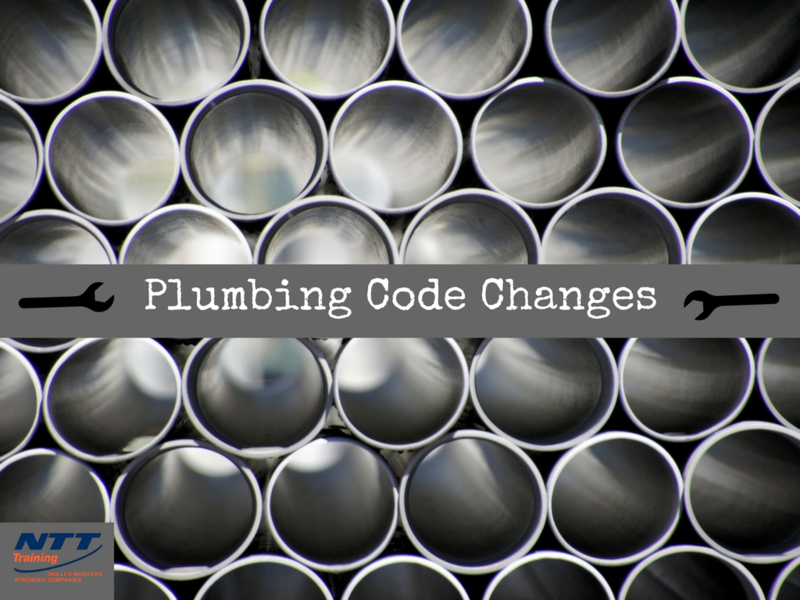 Do you want to be among the first to learn about the new plumbing code changes? NTT offers seminars on Plumbing Codes to help keep you up-to-date and compliant with all laws and regulations. NTT Training Inc. is accredited by ACCET to train individuals. If you would like more information Contact NTT and see how you can keep your work safer.